I thought it might be time for a little refresher on the NKBA‘s standards for door interference in residential bathrooms, kitchens, utility rooms, etc. It’s something that comes up a lot with my emphasis on aging in place, but it is relevant to anyone who works with clients who have physical limitations, run a small business from home, or other special circumstances. Entry doors should be at least 32″, or 2′ 8″, wide. Entry doors should be at least 2′ 10″. The clear opening for doors should be at least 34″ wide, which would require a 3′ 0″ door. There should be 18″ of clearance on the pull / handle side of the door. No door should interfere with the safe use of appliances, equipment, or other doors. There should be clear floor space for maneuvering. A 3′ 0″ doorway is almost always used in commercial properties (but you don’t always have that convenience in your home). Following these guidelines gives plenty of room for everyone to move through the doorway, as well as move furniture throughout the home, carry a load of laundry or a platter full of food, or wheel a wheelchair or walk a walker through, without bumping into sinks or other objects in the room. These dimensions are very hard to stick to, especially if you’re renovating. Really, unfortunately, older homes use 2′ 0″ doors more than they should, which are difficult to design around. Naturally, that doorway isn’t accessible to someone in a wheelchair or using a walker. Some creativity in using the surrounding walls is necessary to make that doorway work. I find that doorways as small as 2′ 6″ can still be accessible for someone using a wheelchair or a walker. A few years ago, I worked with a client, Mr. Greer. He was a big ol’ guy, in his mid-80s, and wheelchair bound. From his bedroom to his bathroom, there was a 90 degree turn. The most we could squeeze into the space was a 2′ 6″ doorway, with just a little less clearance, but we made it work. Mr. Greer had no problem opening and closing the door without bumping into the tub. He was also able to get in and out of his bathroom with a little finessing. Some clients might insist on using a slimmer doorway, with less clearance, usually for aesthetic purposes. It might look good, but I usually suggest designing for aging in place. It doesn’t matter what age the client is; something could happen – an accident or something – and it is better to already have the clearance in place when the time comes. Of course, the client is always right in the end. Most clients choose to have doors that swing open away from the kitchen. This frees up space in the kitchen that might be necessary during preparation or entertaining. uires a little more space than a single door, but it significantly widens the doorway. 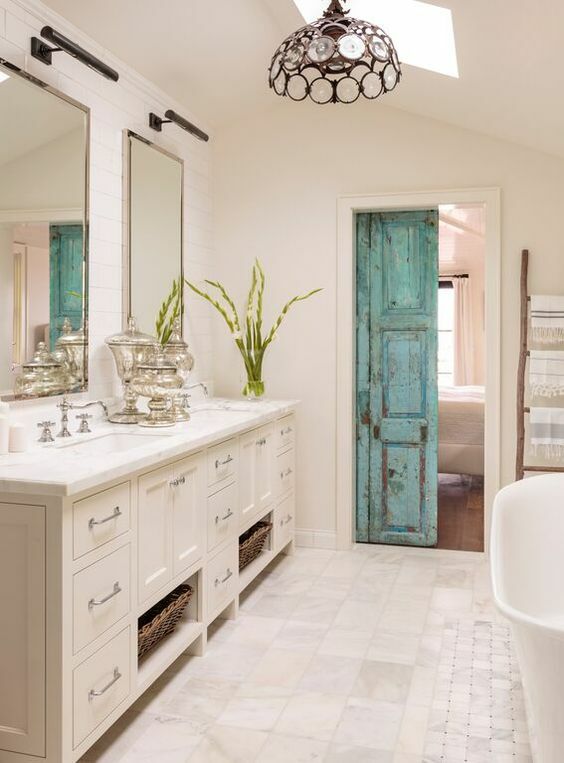 Pocket doors are becoming a really popular way to handle limited door clearance in bathrooms. 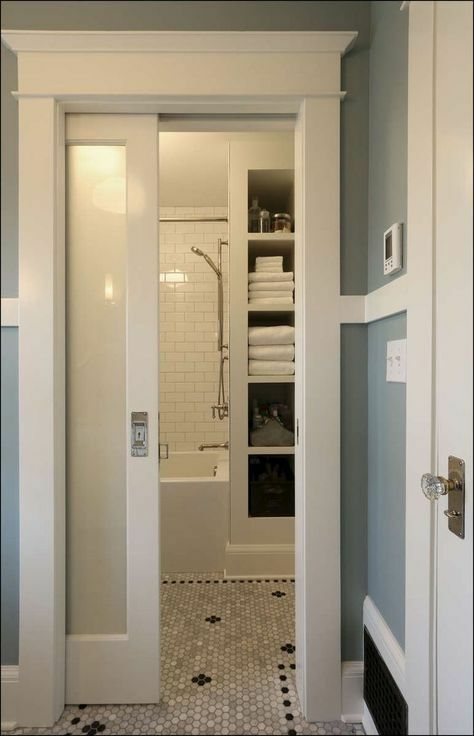 If there is enough wall space to “hide” the door, it could be the answer to your client’s needs.